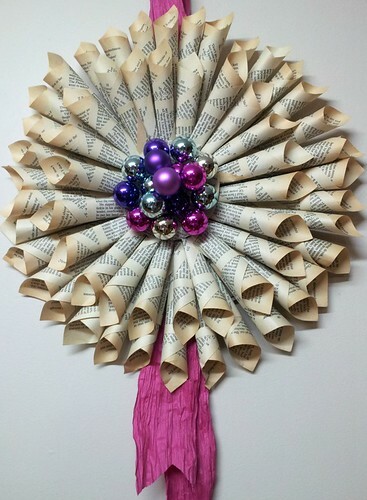 If you've been thinking of making a rolled book page wreath, now just might be the perfect time to do it. Licia Politis made the examples you see here, inspired by some she saw on Pinterest. They're big, colorful, and a pretty decoration for the holidays or anytime, depending on your choice of accessories. Licia added lots of her own touches. It's hard to choose a favorite, but I'm drawn to the combination of shiny and matte gold ornaments in the center of this tri-layer elegant beauty. Here's an oval wreath that would look great all year long. Licia upcycled an old frame by spray painting it deep purple and then painted a purple bird on a book page as the central motif. Pages with edges that are beginning to yellow look especially nice when rolled due to the color variation. Lucky for us, Licia jotted down a list of construction tips that I used to write up these instructions. Old book pages - about 70 - Licia likes to use paperback books because the pages tear out easily and the paper is a nice weight for rolling. Step 1. Roll a single book page into a cone. Staple the end approximately 3/4 inch (2 cm) from the tip. Repeat x 70. Step 2. Trim the cardboard corners to make a circle (or you can just leave it square) and draw two evenly spaced circles within the circle as guidelines for the two layers of cones. Step 3. Optional - If your wreath will be hung where the cardboard backing can be seen (i.e. through a glass door or window), cover the cardboard by gluing on extra pages with craft glue or a glue stick. Step 4. Attach the hanging ribbon/bow to the top back of the cardboard. Trim ends with scissors. Step 5. With tips facing inward, hot glue four cones at the north, south, east, and west points using the outermost drawn circle as a guideline for tip placement. Continue filling in between these cones until the first layer is complete. Step 6. Repeat for the second layer using the innermost circle as a guide. Step 7. Arrange and hot glue colored balls at the center. Step 8. That's it - hang and enjoy all season long! 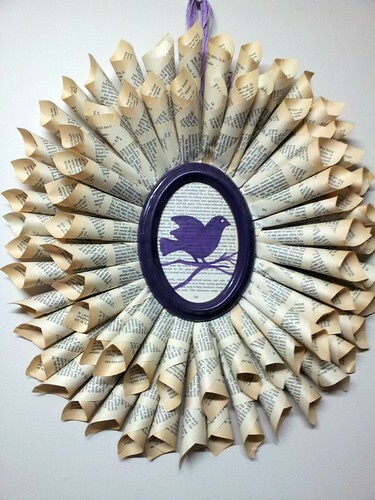 Stay tuned for another type of book page wreath coming up soon. I've seen quite a few of these floating around on Pinterest. I love the looks of them. Thanks for sharing the tutorial. I just might make one this weekend. Lovely Wreath and so easy to make too. Thanks for the instructions Ann. Thank you for this tutorial! I just made one!! Here is the link to mine!! It's very pretty Shannah; thanks for sharing your link. So glad you liked seeing Licia's wreaths - me too! She gets all the credit. 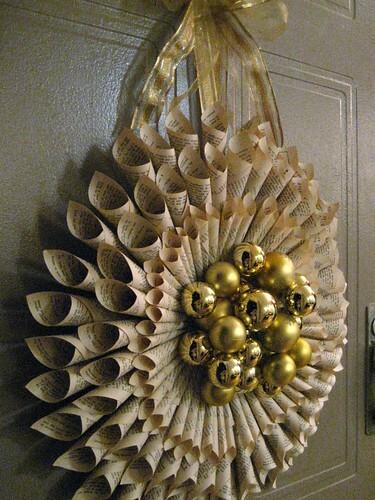 A wreath made from rolled Christmas carol music sheets would be a lovely holiday variation, too! Spent the summer collecting hymn books from garage sales. Everyone LOVES the wreaths I made from those. Glad to hear that, Susan!